The government is an important player and one that cannot be ignored. Undermining the government is not the way forward. Our job is to engage with it and make it an effective partner. The Constitution of Bangladesh recognises the right to freedom of speech and expression, which includes freedom of artistic expression. I start with a premise that I live in a free country and am determined to exert my constitutional rights. We have worked with the government. At the same time, along with Freemuse and PEN International, we have submitted a report to the UN Human Rights Council where we’ve pointed out that legal restrictions and the threat of deadly violence curbs artistic freedom in Bangladesh. So we use 360 degree activism. Working at all levels and using all the tools and the strategies available to us. Much of our work relies on solid research. We have excellent data and analysis, produced by a strong research team. This is the basis of our journalistic credibility. We are not a funded organisation, though we do work with charities and donor organisations on a contractual basis, as we feel reliance on funding would undermine our independence. We try to generate the funds for our activism which gives us a freedom funded organisations rarely have. It also creates a much more robust work ethic. We need to be able to compete in quality and performance in order to survive. In 2004 the Bangladesh government set up an elite force called the Rapid Action Battalion, in short RAB. It was given enormous powers, essentially a license to kill. It was meant to curb corruption. It was a Frankenstein. The word “Crossfire” terrorised the public. 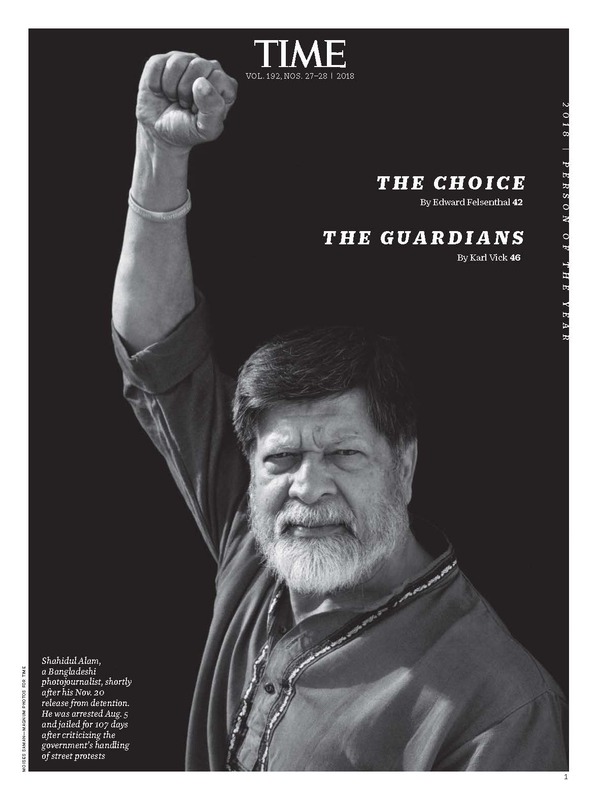 As with all our work, the politics of the story was embedded in the aesthetics. So you could not separate them. The photographs were taken in the middle of the night. Family members remember the torch on their faces, when first confronted by RAB. So the photographs were all lit by torchlight. The scenes were what the dying might have seen in their last living moments. We deliberately used no captions. 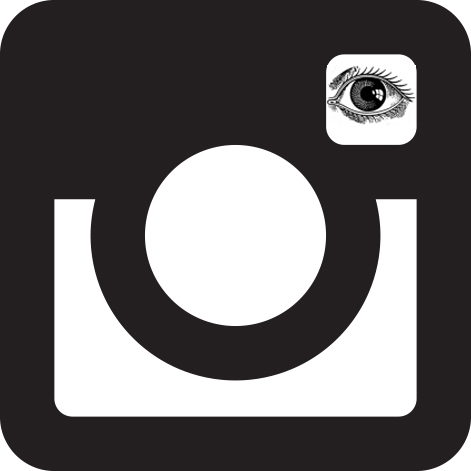 The audience was invited to work out the relevance of the image. We had extensive case studies and produced a Google Earth map which had all our research findings and complete data. So while the captions yielded little data, it did allow the viewer to find it for herself. We also worked on the media strategy. Knowing the latency between information appearing in the media in the west, and it producing a response in Bangladesh, we had a media embargo till midnight on 17th March for North America, 19th March for Europe and I appeared on TV on midnight on 21st March. The show was to open on the 22nd, giving the government little time to prepare a well-planned response. Predictably, the government’s response wasn’t well thought out. They did what they usually do, tried brute force. They initially sent messages through various means to get us to take down the show, and when they realised we were going ahead they sent armed police and closed down our entire office including the gallery. On the other hand, we had prepared well. Mahasweta Devi, South Asia’s most respected activist and author, had come over from India to open the show. As the gallery was closed, we had the opening in the streets. The entire event was live streamed. 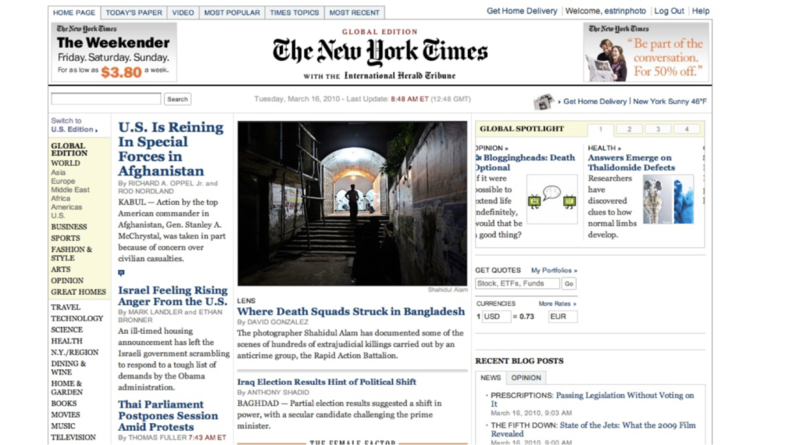 The media coverage was massive, both nationally and internationally. We were on centre stage and we utilised the spotlight upon us. It was a performance. Mahasweta un-handcuffed me, symbolically restoring freedom. Nurul Kabir, the editor of Bangladesh’s most outspoken newspaper and a hugely respected journalist also spoke at the opening. We had pre-scheduled a Skype conversation with Alain Julian the secretary general of Reporters Sans Frontiers in Paris. While the armed police surrounded the gallery preventing the waiting audience, which included several Ambassadors as well as international curators from Africa, Latin America and other parts of the globe. I sneaked into the gallery and had my Skype conversation with Alain as I did a gallery walk, all of it being live on the Net. The government didn’t know what the hell was going on. A gallery that they had sealed off, had, through the Net, invited the world inside! 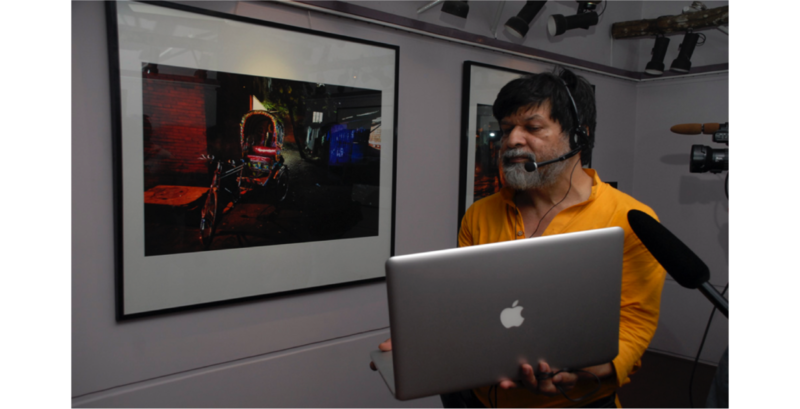 I sneaked into the gallery to give a gallery walk on Skype with Alain Julian, in Paris, the Secretary General of Reporters Sans Frontiers. We also challenged the illegal closure through a writ petition lodged by one of the foremost human rights lawyers in the country. It worked. The government backed down and removed the police and we had the show reopened. By then the next show in the gallery was due, so we hung the show in the corridor leading to the gallery and the foreign minister of Bangladesh, who was opening the next show had to walk past the very images her government had unsuccessfully tried to block the public from seeing. This last act had not been pre-planned but was opportunistic. We adapted to the situation as it unfolded. The foreign minister (in green sari) walks through corridor lined with Crossfire photos. We’ve also developed other ways to circumvent the system. While we work closely with mainstream media, we recognise their limitations. Their commercial interests lead them to produce programmes that only cater for their immediate stakeholders, the urban elite. So we identified and trained local correspondents, and utilising the new technological developments, armed them with the iPod Touch and trained them to edit their work using these devices. Today we have 43 correspondents all over Bangladesh, providing 3 to 5 minute video reports on stories of importance to the rural public. This is something that most major media houses do not have. 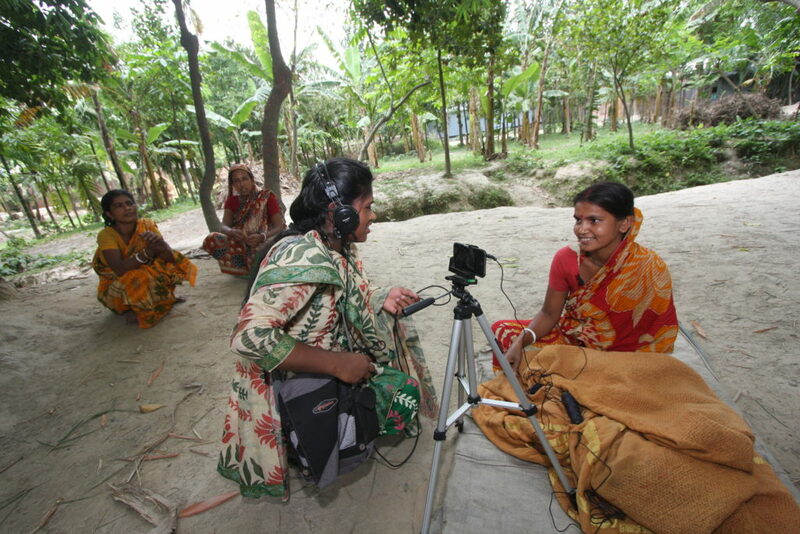 The German TV channel Duetsche Welle, broadcasts one of our stories from rural Bangladesh, every week, allowing villagers in rural Bangladesh to speak to a global audience. Correspondent from Drik’s Rural Visual Journalism Network (RVJN) in the field. Since 2011, my work has dealt with the disappearance of the indigenous activist Kalpana Chakma, a leader of the Hill Women’s Federation in the Chittagong Hill Tracts of Bangladesh. The most recent work, Kalpana’s Warriors, was adjudged the “Best Exhibit” at the Dali Festival in China. 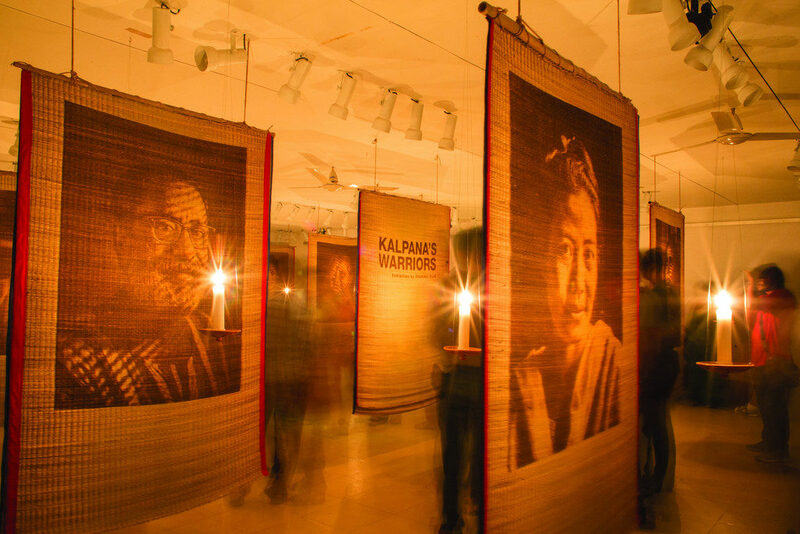 In 2018 it showed simultaneously at the 1st Kuala Lumpur Biennale and the Freedom Fest in Newcastle. The images were made using laser etchings on straw mats. A technique especially developed for this particular intervention. 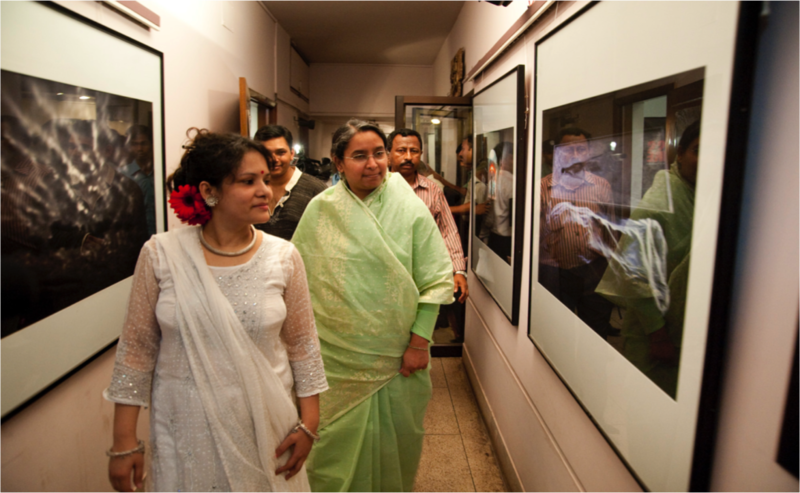 Premier of “Kalpana’s Warriors” at Drik Gallery on 12th June 2015, the 15th anniversary of Kalpana’s disappearance. Embedding the politics of the story within the media itself is something we constantly do. Our protest against the extremely poor working conditions of workers in Bangladeshi garment factories, used the very platform that the fashion and garment industries use for their advertising. We photographed the burnt carcass of Tazreen Fashions where a fire had broken out because of unsafe storage conditions. Many garment workers had died as the factory had insufficient fire exits and workers were trapped inside. 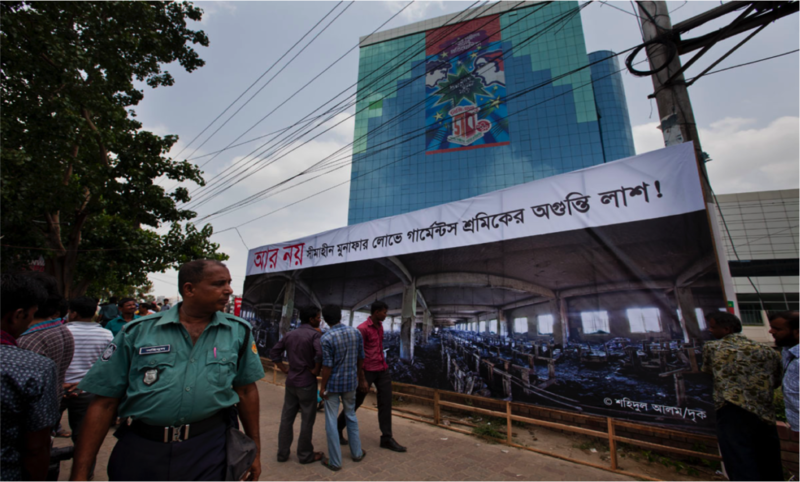 Photo of carcass of Tazreen Fashions where many garment workers died, made into billboard and erected in front of building housing the garment owner’s association. Part of Drik’s “No More” campaign. We printed the image of the burnt out factory floor onto a billboard and erected it in front of the 15 story building, built illegally, that houses the office of the garment owners’ association, and staged a play there. The government had never faced resistance of this sort and while they did send an armoured truck and policemen with guns, they didn’t really know how to deal with the situation. The theatre they are skilled at has more to do with propaganda and spin. We followed this up by photographing the building and inserting newspaper reports of the mayor (a former president of the garment owner’s association) complaining that the city was getting flooded due to illegal building construction! We set up this billboard in front of the building too. We recognise that galleries are elitist spaces, which only attract a certain class of people. We recognised that we had to break these class barriers if we were to be effective. If people do not go to the gallery, the gallery must go to the people. While we have produced work that has made its way to some of the finest galleries in the world, we have also gone to remote villages where local activists have put up laminated prints on streetside walls. 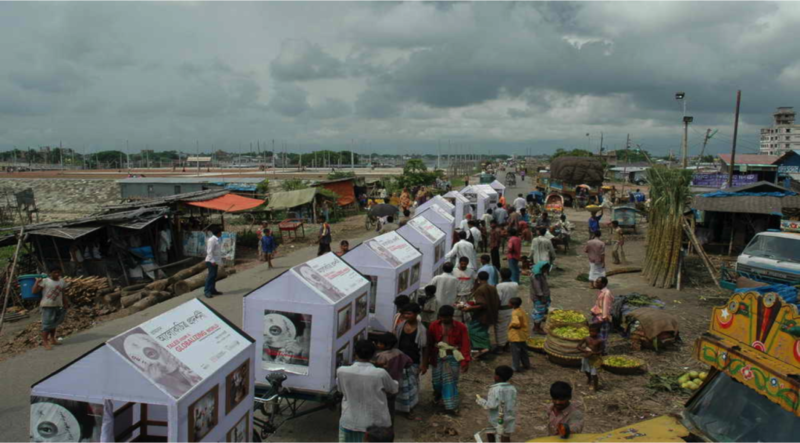 Our shows have been on bullock carts and rickshaw vans, and have gone to football fields, bazars and school playgrounds. 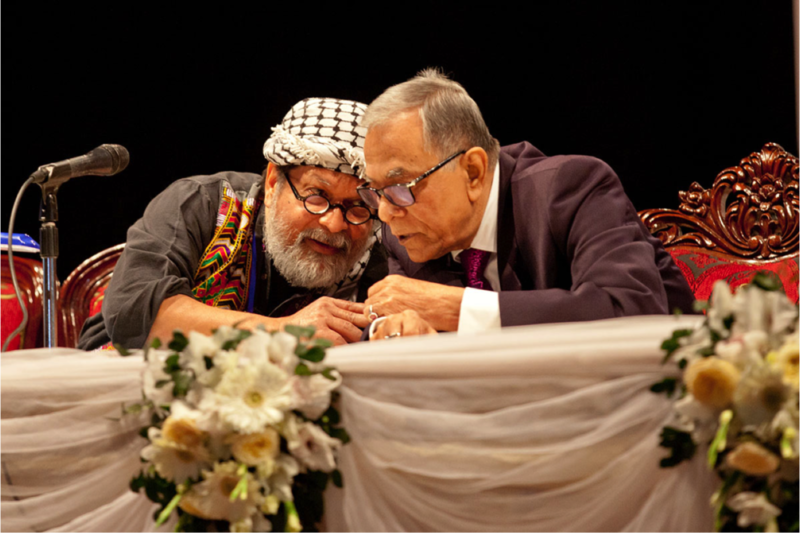 Shahidul Alam, one of the most vocal civil society critics of the government, having a tete a tete with the President of Bangladesh at the opening ceremony of Chobi Mela. On the other hand, while we speak truth to power, our attempt is to steer the government in the right direction, rather than to weaken it. Our festival of photography is now one of the highlights of the Asian art calendar. We invited the President of Bangladesh to open the festival, congratulating the government for supporting us, despite knowing that we were often critical of their actions. By tabling our position in a public event attended by senior government officials, ambassadors and giants of the global art and media scene, we were able to establish our relationship with the government as that of a critical ally. 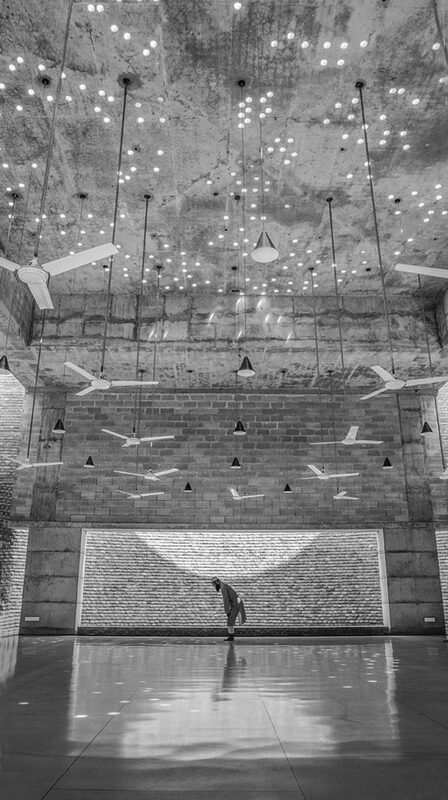 Our most recent exhibition, a photography show that we held in a mosque, was unusual because of the venue. 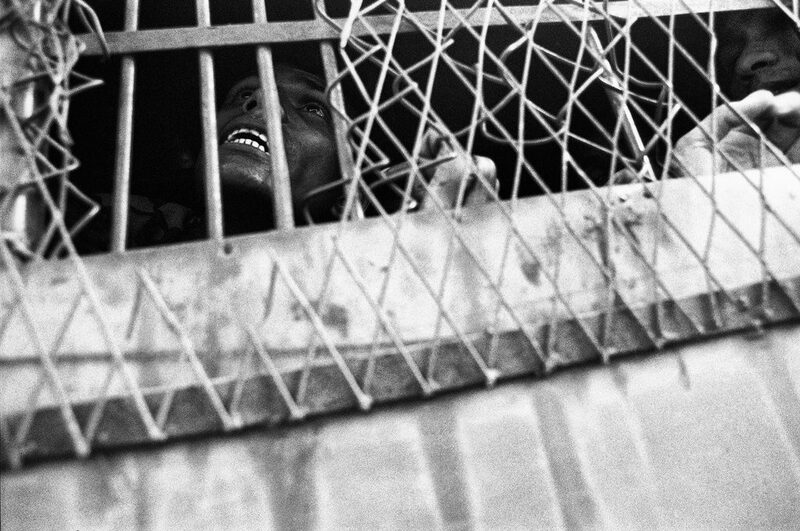 Contemporary Salafi Islam is known for its resistance to art, especially photography. By holding a photographic exhibition in a mosque we were able to bring attention to the fact that in the days of the prophet, the mosque was not simply a place of worship, but a community centre that served community needs. People of all gender, sexuality and religion came to the opening. By breaking the taboo of having photographs in places of prayer, we were able to pry open a space that had long been in the grips of conservative Muslims, opening up their minds to the egalitarian nature of their own religion.